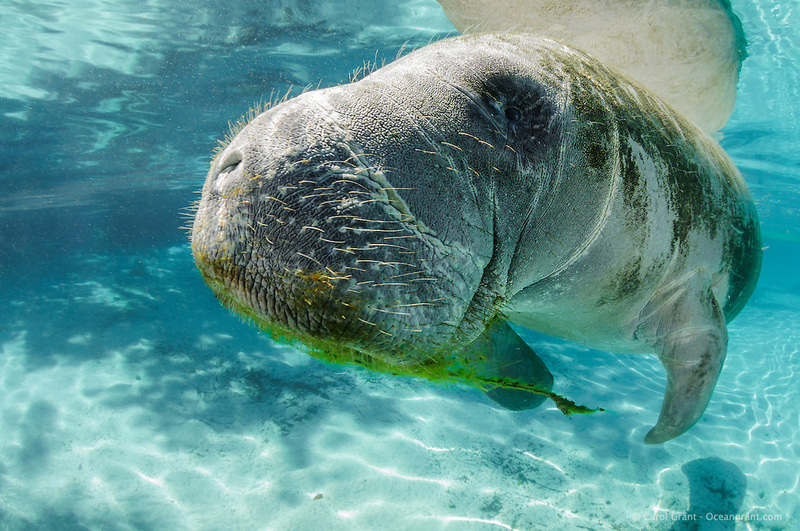 Florida manatee, Trichechus manatus latirostris, a subspecies of the West Indian manatee, endangered.An adult manatee with green algae on its snout swims in the warm blue freshwater. This type of algae is not eaten but was probably encountered while foraging. The manatee's whiskers and hair follicles are prominent. Horizontal orientation. Three Sisters Springs, Crystal River National Wildlife Refuge, Kings Bay, Crystal River, Citrus County, Florida USA.